Reports of a lawsuit alleging that former NASCAR driver Greg Biffle hid cameras in private areas of his family home came out last week, but details were vague. Jalopnik now has a copy of the lawsuit, and the allegations—including 24/7 DVR recording and his race team having access to the feeds—are incredibly bizarre. Last week, we reported on the suit against former Monster Energy NASCAR Cup Series driver and current NBC Sports guest analyst Biffle filed by ex-wife Nicole Lunders Biffle and her mother. The two alleged Greg Biffle placed hidden cameras in the house’s master bedroom, bathroom and guest bedroom, which they discovered in 2015. Local news reports said the lawsuit alleged Biffle showed video footage from the cameras to others, and that he said under oath that they were installed because he thought the cleaning service was stealing from him. It did not, however, say why Roush Fenway Racing was being sued alongside Greg Biffle. But upon obtaining a copy of the lawsuit—which was not available last week—Jalopnik has learned that the case has a laundry list of allegations by Nicole Biffle and her mother against Greg Biffle and the team, beginning with the claim that an employee of Roush at the time, Ricky Matthew Reavis, came to install the cameras. The lawsuit claims cameras were installed in a way that wasn’t visible to the naked eye, and that Reavis helped Greg Biffle activate ones in the master and guest bedrooms. From there, the allegations are that Greg Biffle had the cameras connected to a DVR recording system located in his gun safe. The lawsuit alleges that Reavis and Biffle connected the system to an app on their smartphones that allowed both of them to access the feed 24/7, and that Reavis’ phone used to access the cameras was owned by Roush the entire time. Nicole Biffle and her mother allege that Biffle showed footage to others, and the lawsuit said Reavis admitted to uploading images and data to an internal server owned and maintained by Roush Fenway in case the files got written over in the DVR system. The belief put forth in the lawsuit is that the information is still on the race team’s servers, but that it isn’t known if others at the team accessed it. What’s not clear from any of this is the obvious question: why Biffle allegedly recorded the footage in secret, or the types of footage that were recorded. The lawsuit said Reavis admitted under oath to having unlimited access to the footage through the phone app, and that it is believed Roush knew or should have known what Reavis and Greg Biffle were using the team’s resources for. 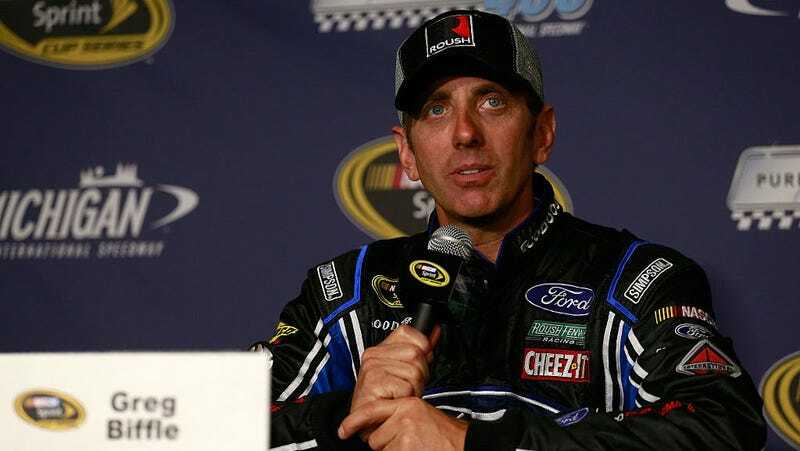 It also claims that despite Greg Biffle’s statements about the cleaning service under oath, he offered multiple, inconsistent reasons for the cameras over time. Jalopnik has reached out to Roush Fenway Racing, which Greg Biffle parted ways with after 19 years at the end of 2016, for comment on the allegations. But if all of that wasn’t enough for you, here’s the full lawsuit. It’s a weird case, and it’ll probably get weirder as we learn more.